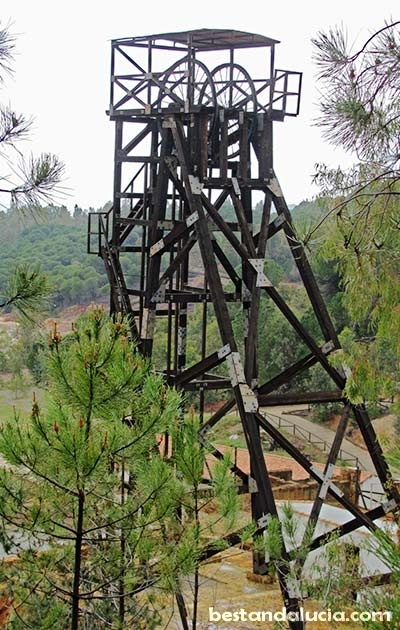 Minas de Rio Tinto, which translates as the Mines of the Red River, is an ancient mining town, located on the road between Huelva and Aracena in Andalucia. The history of mining in this area dates back to 3000 BC. In Roman times, the site along the river was extensively mined for silver and the precious metal was used to mint Roman coins. In fact, Rio Tinto used to be one of the richest sources of silver in the ancient times. 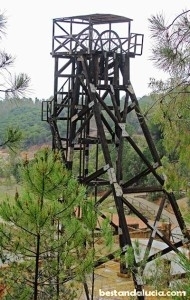 For centuries the mines were abandoned until they were rediscovered in the 18th century by a couple of Spanish companies. Exploitation of the area rich in cooper commenced. The reddish brown metal was transported to the steelworks in Seville on a massive scale. In the second half of the 19th century, British companies started to mine pyrites in the Rio Tinto region which then was used in the production of sulphur dioxide. The largest of those companies was Rio Tinto Company active in the area between 1873 and 1954. The main rivers of this region, Rio Tinto and Rio Odiel, are intensively red in colour. It is perfectly natural phenomenon, only partially enhanced by human activity. The waters of Rio Tinto and Rio Odiel are undrinkable because of high acidity and heavy metals content. Riotinto Mining Museum is a must-see attraction of the region. It is located in the Minas de Riotinto village. Launched in 1992, the museum offers a fascinating journey through 5,000 years of mining and metallurgy in the area. There is a great number of displays and exhibitions in English, captivating even if are not really interested in the history of mining. Another attraction is the train ride down the Rio Tinto valley. The ride in a refurbished 19th century steam locomotive allows you to get the close look-up at the fascinating landscape of Rio Tinto. The ride is 22 km long and a little bit bumpy at times. It includes a 20 minute stop to have a closer look at the Rio Tinto river. During the train ride you will be able to admire the unique and fascinating lunar-like landscape of Rio Tinto mines from different angles. Pena de Hierro near Nerva, about 10 kms from the Riotinto village, is another spectacular place to visit. It’s an oval in shape, opencast mine 85 metre deep, 350 metre long and 150 metre wide. 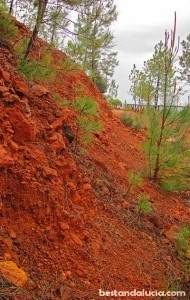 The walls of Pena de Hierro represent a mesmerizing mix of white, yellow and reddish-brown colours. 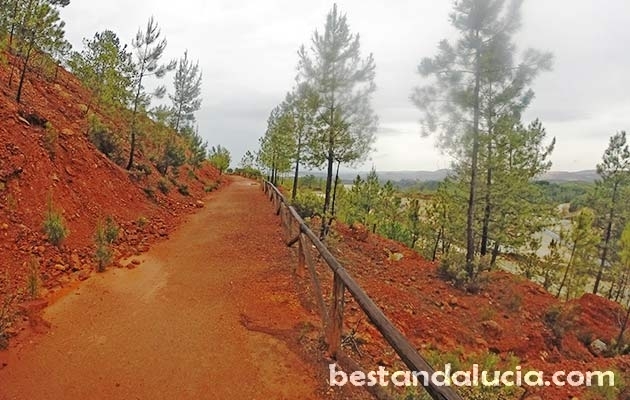 Pena de Hierro is surrounded by some nice cycling and walking paths in the forest. There are some nice viewing points along those paths as well. 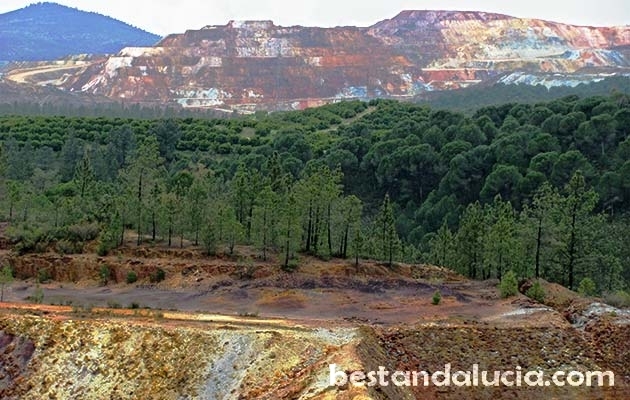 Rio Tinto mines are home to what used to be the biggest opencast mine in the world – Corta Atalaya. 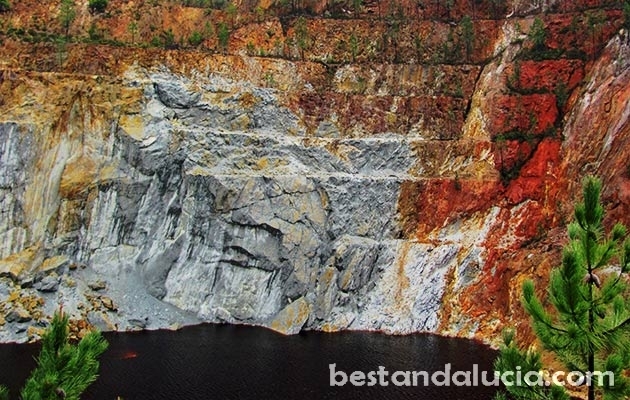 This impressive mine is 1200 metres long, 900 metres wide and 365 metres deep! However, it is impossible to access Corta Atalaya at the moment. Not many people know that Spanish football wasn’t born in Madrid or Barcelona, but in…Minas de Rio Tinto. In 1873, the British and European investors reopened the mines forming Rio Tinto Company Limited. Spanish workers worked alongside employees from the United Kingdom, where football had already been very popular. After the work the British would often spent their free time playing football. For the Spanish football was a discipline they saw for the first time, and they would at first consider it too dangerous and leading to injuries. They would even forbid their curious children to watch the games! However, after some time the Spanish workers took to the new game. The first Spanish football club was established in Huelva in 1889. For some reason, Rio Tinto still remains pleasantly untouristy, so no matter when you come, you should not beware of crowds. However, try to avoid summer as the inland areas of Spain becomes really hot then.